The event marks the commencement of a busy year for women’s football in Solomon Islands as was highlighted to the participants by the SIFF women’s development officer and coordinator for the local programmer, Diane Justus. Speaking at the opening of the programme on Saturday, SIFF executive member, Angeline Vave, encouraged the participants to aspire to become footballers and play for the national team in the future. “All of you here today have the potential to play for your country in the future and this is where you take the first step towards that goal,” Vave said to the enthusiastic crowd. Girls who attended the event ranged from 11-12 years old but several younger children also showed up and came from schools and communities in Honiara. All together 15 schools and two communities were in attendance. The event continued on Sunday to allow for girls who could not turn up on Saturday. The theme for the event “Healthy Lifestyle is Achievable” a message that is aimed at promoting children to engage in sports to stay healthy and avoid non-communicable diseases. The programme featured games and training drills designed for participants to learn some football skills but at the same time enjoy and have fun. The mini matches were a particular hit for the young girls, some of whom were playing football for the first time in their lives. Each school was rewarded with one football for participating in the event. One of the participants Annette Mila says that she really enjoyed that festival and looked forward participating more in football. “Today was so much fun for myself and my friends – we really enjoyed playing football. I really want to play more and hope that opportunities like this come more often,” says Mila. The SIFF office also announced that more festival events are scheduled for the year. 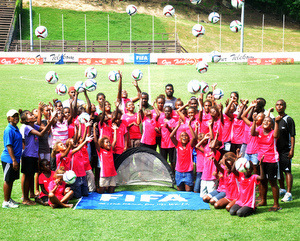 However, these festivals will be held in the provinces to help promote women’s football outside Honiara. The FIFA Live Your Goals campaign was launched with the FIFA Women’s World Cup in 2011 and is celebrated worldwide. Following a pilot phase in 2012-2013, FIFA would like to make “LIVE YOUR GOALS” available to member associations, as part of its support for women’s football development as well as to ensure that the campaign has a worldwide impact. SIFF acknowledges and thanks FIFA for their support for the FIFA Live Y our Goal programme.